Milcrest Estate's red wines are something special. They are hand picked, hand crafted and picked at optimum ripeness on taste and not entirely on sugar levels. They are complex structural wines that are made to cellar. We use Extende cloth in the inter-rows to obtain 100 percent physiological ripeness and to speed up the ripening process. The cloth gives us the equivelent of an extra 6 degree rise in temperature by reflecting light up into the canopy and ensures no green characters present. It also allows the bunch ranches to lignify and thereby prevent the update of water towards the last couple of weeks of ripening thus avoiding splitting and disease pressure. The 2014 vintage in Nelson produced stunning Syrah. Our previous 4 vintages have all produced a Gold medal winning wine and this wine will be following suite. A little lower in Alcohol at 12.5% this wine has great fruit concentration and lovely white pepper aromas. bottled on the 24th March this wine will develop into a lovely example of a cool climate Syrah reminiscent of the Rhone Valley, French style. As can be seen above, we use reflective cloth in the inter-rows to reflect light up into the canopy and to get the fruit 100% physiologically ripe. This allows the rachas to sinesse and there by prevent any further uptake of water during rain events, which results in no splitting or dillution of flavours. The 2014 Syrah is a Rhone style wine, utilising a Rhone yeast and thereby producing characters similar to the famous french region. "Leather on the nose, white pepper and spice combine with soft tannins and a silky ellegence that makes this wine a joy to drink from bottling. It has lovely fruit and will continue to gain complexity and structure over the next 4 - 7 years. A great wine to cellar"
It is a fantastic accompaniment to Venison, steak and game. 2011 vintage - 93 Points, Lex Howard for Winewise Magazine, Sydney, Australia. The 2014 Vintage was truly outstanding, a perfect growing season with little or no disease in the Nelson Region. The wines made in this vintage are some of the best wines in the last 25 years. This wine is a complex structural wine, made from a combination of 7 clones grown on our Moutere site. It is unfined and unfiltered thereby retaining full bodied fruit flavour. Smokey, bing cherries, spice and earthy charcaters dominate this wine. It is a wine that is made to gain complexity from 4 - 9 years and will continue to evolve. Drinking great now, but will cleear for another 6 years. A great accompaniment to steak, duck, beef and lamb shanks. The 2013 vintage was a fantastic growing season across New Zealand, a perfect fruit set with small but concentrated bunches. A long Indian Summer ensured gradual ripening and fantastic fruit. Nelson had by far the best growing conditions for this vintage and resulted in some great Pinot Noir's being produced. This wine is a complex structural wine, made from a combination of 7 clones grown on our Moutere site. It is unfined and thereby retaining full bodied fruit flavour. Smokey, bing cherries, spice and earthy charcaters dominate this wine. It is a wine that is made to gain complexity from 4 - 9 years and will continue to evolve. With 4 years bottle age this wine is drinking fantastic, but will cellar for another 3 years. The 2013 vintage was a stuning vintage in New Zealand, a warm settled start ensured a fantastic fruit set and large yields. A long warm summer and cool nights ensured great flavour development and little disease pressure. Milcrest Estate is one of only two producers of this Italian Piedmontese varietal, Dolcetto, in New Zealand and this site is renowned for its fantastic reds as a result of the gentle North facing Moutere clay slope, wonderful aspect and unique micro-climate. This is the same site that we grow our famous Syrah, Merlot and Montepulciano. This wine is a complex structural wine, made from 100% Dolcetto. It is unfined and thereby retaining full bodied fruit flavour. Aniseed, liquorice and plums are dominant on the nose and palate. This wine is a dryer style than the traditional Italian Piedmontese example, but it has wonderful concentration and will cellar well over the next 2 - 5 years. A great accompaniment to Pizza, Pasta or anything with a saltiness.. The 2014 vintage was a stuning vintage in New Zealand, a warm settled start ensured a fantastic fruit set and large yields. A long warm summer and cool nights ensured great flavour development and little disease pressure. Milcrest Estate is one of only A handful of producers of this Italian varietal, Montepulciano in New Zealand and the site is our Golden Hills site renowned for its fantastic reds as a result of the gentle North facing Moutere clay slope, wonderful aspect and unique micro-climate. This is the same non-irrigated site that we grow our famous Syrah, Merlot and Dolcetto. This wine is a complex structural wine, made from 100% Montepulciano. It is a soft tannined full bodied wine. Liquorice and plums are dominant on the nose and palate. This wine is a smooth soft easy to drink style, but it has wonderful concentration and will cellar well over the next 5 - 7 years. A great accompaniment to Pizza, Pasta or anything Italian. 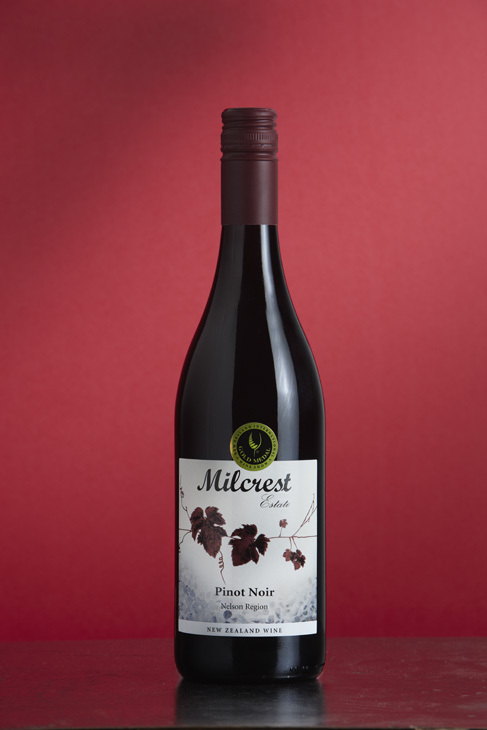 Top 12 Other Reds in NZ - Dish Magazine 2014.